Terra di Lavoro. Land of Work? The provinces of the Kingdom of Naples in the mid-1700s. I love folk etymologies as much as the next person. “Yankee” might be from the Cherokee word for “coward,” eankee, or from the Dutch Jan Kees (roughly ‘John Doe’), or a back-corruption from key anchor, an oddly shaped anchor on Boston sailing vessels— thus, to yank key (weigh anchor). Who cares? Not I. Thus, when I first heard the old term for the area between Naples and Caserta, Terra di Lavoro, I was quite prepared to accept the face-value translation: Land of Work! It must have meant (1) the place where all the work was, or (2) the place where they made you work a lot. I have just conducted an informal poll (I was in my pajamas) and most of my neighbors are quite happy with one of those two interpretations. Well, maybe not 'happy' —that thing about 'work'— but that's what it must mean. Quantum autem universas terras campus Campanus antecedit, tantum ipsum pars eius, quae Leboriae vocantur, quem Phlegraeum Graeci appellant, finiuntur Leboriae via ab utroque latere consolari, quae a Puteolis et quae a Cumis Capuam ducit. Just as this land [ancient Campania] surpasses all others [in terms of fertile soil], so is it, itself, surpassed as much again by the area within it of the Leborie, which the Greeks called the Campi Flegrei. The Leborie are bounded on both sides by the consular [main] roads that lead to Capua, one from Pozzuoli, the other from Cuma. Thus, the lavoro in Terra di Lavoro —just aching to be translated as “work”— may be a variation of the name of an ancient people, the Leborians. On the other hand, say other sources, the word may be a place name, a geographical description from a vague linguistic root. If all this sounds too much like Yankee to you, you’re right. In any event, the term is remembered today only because it duped centuries of Italians into thinking that there was work to be had down south. The original names (codified under Caesar Augustus) for the Roman province of Italia were 1. Latium (including Rome) and Campania 2. Apulia and Calabria, 3. Lucania and Bruttiuin, 4. Samnium, 5. Picenum, 6. Umbria, 7. Etruria, 8. Cisalpine Gaul, 9. Liguria, 10. Venetia and 11. Transalpine Gaul. Those names fell out of use, at least as meaningful geopolitical divisions, after the fall of the Roman Empire. By the end of the 11th century southern Italy had been transformed by the presence of the Normans and was just a few years away from beginning its long existence as the “Kingdom of Sicily” (then, “Kingdom of Naples”). 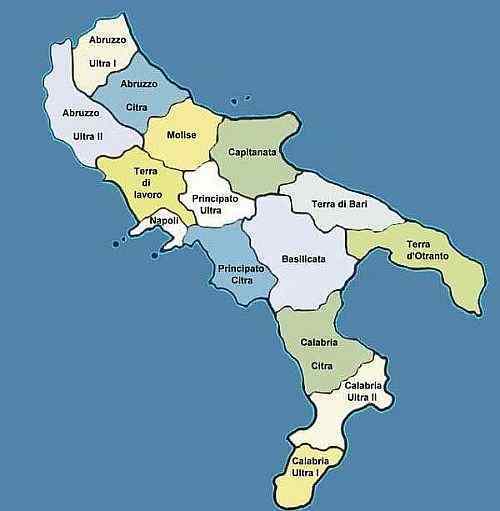 At that time, the south (excluding Sicily) was divided into Apulia, Calabria and Terra Laboris. And there is that term again, on its way to becoming lavoro. The name also crops up as a reference to the medieval Duchy of Naples (before the arrival of the Normans) as Liburia Ducalis, and Capua, itself, was Liburia Capuana. By the time of the Bourbon Kingdom of Naples in the 1700s, the name Terra di Lavoro was firmly entrenched; it covered roughly the area of the modern Italian province of Caserta, extending through part of the modern province of Naples. The area got both a material and cultural boost when King Charles of Bourbon chose Caserta for the site of a grand royal palace in the mid-1700s. After the Congress of Vienna in 1815, Terra di Lavoro became a “department,” a still larger unit, within the Kingdom of the Two Sicilies (the official name of the Kingdom of Naples between 1815 and the end of the kingdom in 1861). The capital of Terra di Lavoro was Capua for many centuries; in 1818 Caserta was made the provincial capital. In 1863, shortly after the unification of Italy, the province was drastically truncated by the administrators of the new Italy, with various towns being reassigned to adjacent provinces. The historical term, Terra di Lavoro, was abandoned and, as with elsewhere in Italy, the province was named after its capital and largest city, Caserta. 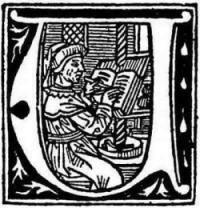 We shall never know the name of the Medieval Quill-Pusher (illustration, right!) who —perhaps having a bit of fun on a dull day at Ye Old Royal Chancellery— unloaded that bit of linguistic malpractice that had people thinking that it all simply meant Land of Work. Maybe he was yanking our key.